I would like to share with you a make up that I am currently wearing and also something that am wearing very frequently :) There's nothing special about it, just something that I wear on regular basis. 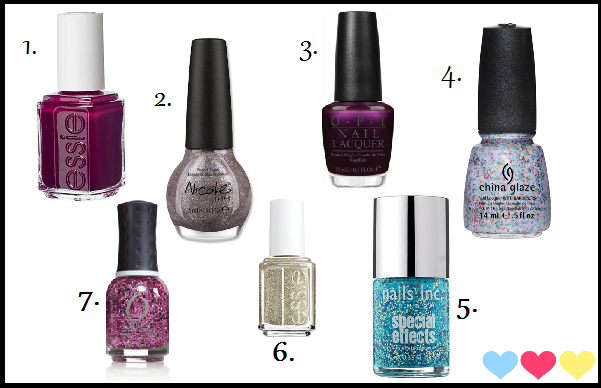 Since December is almost here I would like to share with you nail polishes that are currently very high on my wishlist. I'm back :) It has been so hectic lately and I didn't find time to blog at all! I used Essie - Mint Candy Apple (2 coats). Then I added Essence - Hello Holo and I stamped some hearts with Essence stampy designs plate. Do you like those nail polishes, what do you think of them? So what have Slovenian bloggers been up to last week? Tina showed us her outfit. Nuša - Moonchild did a lovely manicure in her twin post with Taya. Katiee* did a moustache manicure! Zala tried saran wrap manicure. Two Matejas were a little nostalgic. And Maja did excellent with her 7-day challenge! Today I have another nail polish from Max Factor, that I got in the gift bag, to show you. It's a beautiful dark blue color with very small, almost invisible shimmer. I still don't like the brush, but everything else went perfect. I applied 2 coats. The shade is called Cloudy Blue. After that I added one of my favourite glitter nail polish on my thumb and ring finger, called Blue Addicted from Essence. I wish you all an amazing day! I have another manicure with striping tape, but this time I used it differently. I really like the striping tape, you can make so many different things with it, so many different patterns... I remember how it was like, before I bought those, I was always struggling with regular scotch tape and it never turned out great. Thank you for all your comments, they really mean a lot to me! I decided to do something that I haven't done in a while now. I think this set is awesome. It has amazing stuff in it. I already tried one nail polish and mascara and so far I like it. I don't like the smell of compact powder, but I can't say anything else, because I haven't tried it yet. Isn't it small? Do you have any mini Max Factor nail polishes? Do you have the same problems? The two Matejas got an interview with one of ski jumpers. Santa, read this! Nuša - Moonchild has a winter wishlist. Lora Stella was feeling sportastic! Zala from Mostly Nail Polish showed us a beautiful nail polish. Wanna know what Essence Breaking Dawn Part II eyeshadow pigments look like? UniqaPoly showed them! More from Essence! Taya showed us Home Sweet Home TE. Maja wrote about a beautiful ArtDeco palette. And katiee did some cute nail art. Today I am showing you Essence - Oh my Glitter! It's a beautiful purple colour with small light pink shimmer. The application was easy and I used 2 coats, but I think that it would look even better with 3 coats. "Up to the minute and elegant at the same time! The new Mirror collection from Depend is a dream come true if you want to create the perfect metallic look. The polish contains a new type of pigment that gives the most fantastic metallic results." First I would like to talk about the nail polish that I got. I decided to only get one, because I wanted to test one first and if I like it I'll buy some more. They all looked beautiful in the bottles, but I went with the blue one, called Blue Heaven in number 2043. My expectations were not very high, I knew there won't be a total mirror effect, but I was hoping to get a decent metallic effect. I love the metallic effect that it gives, I am actually not a big fan of metallic shades, but this one is amazing. To sum up, I loved everything about it, the only downside is the price. This small 5ml bottle costs 3,45€. Did you try the Mirror collection? Do you like it? And to all slovenian bloggers out there, come and join us on http://slovenian-bloggers.blogspot.com/. there has been major floods all over Slovenia, especially in our area. A lot of roads are gone and all you can do is sit at home and wait 'till everything is over. Even though the water can't reach our house, I am so nervous, hope that nobody will get hurt and that the rain and that the rivers will stop overflowing. Here I used 2 coats of it and then I used an Essence stampy designs plate with Essence nail art stampy polish in stamp me! black. I think that it does not suit my skintone, which makes me sad, because I really like this color. I don't have anything like this in my collection. Tema Vodni žig. Avtor slik v temi: Ollustrator. Zagotavlja Blogger.